Here is the group in Jan 1999. One of the clubs main events is supporting the communications for the 13th Company's annual running of the Army/Navy game football from Annapolis to the stadium in Philidelphia. The challenge is maintaining communication between the 13th company, 3 chase vehicles, and the command post in Oxford, PA over a period of 18 hours and a distance of 130 miles. MARS allows sailors at sea to talk to family members via phone patches. This is accomplished by a ham operator on board a ship contacting a MARS operator on land. 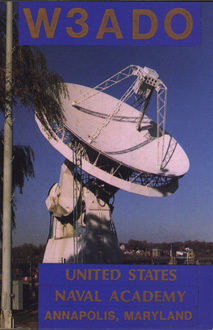 Once the connection has been established, the MARS operator connects his radio to the telephone line and dials the number. The club has a four room shack in the 7th wing of Bancroft Hall at the Naval Academy in Annapolis, MD.